Every PAX is a virtual treasure trove of upcoming indie games, and this year of course was no different. But if you spent a lot of time on the 4th floor, sampling what all the big boy publishers brought to the show, there are a few things you might have missed, especially on the 6th floor, or in the many showcases and meeting rooms of the hotels around the event. The displays may not have been big or flashy, but the games within are worth playing. Here are a few hidden gems I found off the beaten path at PAX West 2018. In Damnview: Built From Nothing, the story is the struggle. The point is simply to exist and get by, and how you go about that is entirely up to you. The game centers on a vast economical ecosystem that gives the player immense freedom in how they choose to play the game, all within the loose confines of its gritty sandbox structure. You can live out your days on the straight and narrow, working a menial job at the laundromat and just scraping by, or you can try to create a vast network of alternate means of financial security, turning to a life of crime. Each action, of course, has a series of potential consequences (for example, you can go to prison and live out the time you serve there) and ultimately, the game is about the difficulties of thriving under capitalism, and the moral compromises and ambivalence we must sometimes adopt to survive under the system. What will you do to get just a little bit ahead under such a dire set of conditions? With a vast set of legal and not-so-legal options at your disposal, you’re about to find out. Part bullet hell, part typing exercise, part unholy abomination, The Textorcist is my kind of sin. Described as a game where the player must escape Hell by casting spells at the Devil, it very much reminds me of the Satanic cult panic of the ‘80s: hokey, hysterical and completely sacrilegious. 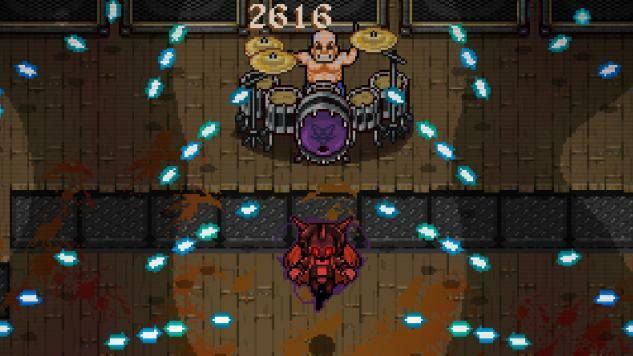 As the player performs exorcisms or battles the possessed evil of their opponents, they must read holy scriptures from their Bible, which appear on the screen to be typed out by the player. However, they must manage to type out the phrases while dodging the many on-screen projectiles (in my case, exorcism vomit). The resulting panic is a lot of fun, even as a spectator—as I stood up from my demo, I noticed an entire crowd had formed to watch me play. Among the many bright and innovative titles to grace the Indie Games Poland booth this year was Bee Simulator, a vivid exploration of the insect world starring its busiest little pollinator, the humble bumble bee. Designed to be a relaxing but educational look at the life of a hive, the demo let me pollinate flowers, meander through fields, deposit honey and even fight other bees, in a gorgeous environment set perfectly to scale. With difficulty settings for both children and adults, plus a free flight mode, single-player story mode, and a split-screen local multiplayer mode, the experience ultimately promises to be deep and varied; developer ?ukasz Rosi?ski also tells me he was heavily inspired by Flower, and wanted to create something as beautiful and relaxing as he felt when he played the game. From what I have seen, the team is well on their way to achieving it. It only takes a few seconds of playing Necrobarista to realize one thing: it is almost impossibly chic. The game, which takes place in a magical cafe where the dead can mingle with the living, is a visual novel with a slick, almost neo-noir aesthetic that masterfully creates an atmosphere of quiet dread mixed with cool. Perhaps its most appealing feature though is the dialogue formatting. While many visual novels are bogged down by their text, Necrobarista stylishly couches each line with dynamic angling and interesting cinematic techniques, giving it the artistic flourishes of a movie even as the player takes a direct role in guiding the action. There’s an element of choice—highlighting certain words in conversation will open up keywords and new stories and details—and how that will fully play out in the final version of the game isn’t yet clear. However, they present an additional layer of interactive intrigue that suit the sensibilities of Necrobarista nicely. My time with The Stillness of the Wind was brief, but nourishing. 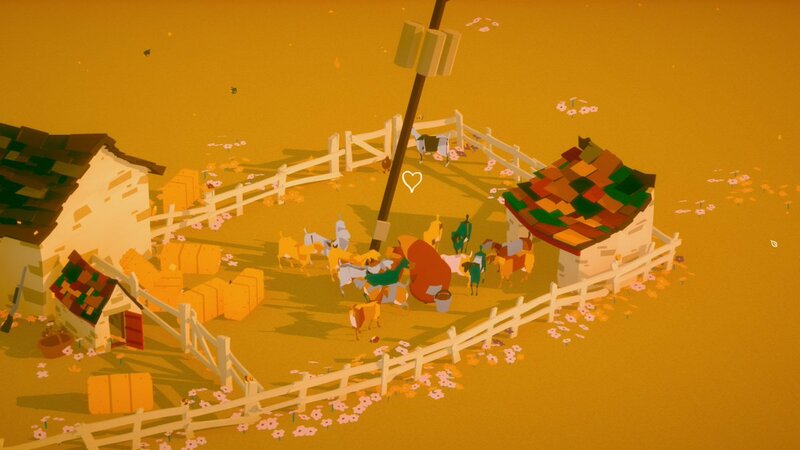 It’s the quiet story of an old woman named Talma, tending her goats and farm and living out her days while waiting for letters from her family, who once lived in her humble village home but have since moved to the big city. It’s not a complicated game with any obvious or urgent objectives; rather, the point is to develop a comforting daily routine, gathering eggs or herbs, cooking, making cheese, or bartering with the traveling merchants, as increasingly worrisome messages from her loved ones arrive and paint a picture of what is happening in the world outside her quaint abode. Imbued with a strong palette of warm tones and a pleasing storybook aesthetic, The Stillness of the Wind promises to be a contemplative experience.